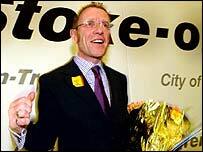 The elected mayor of Stoke-on-Trent is defending his call for a debate on changing the city's name. Mike Wolfe says people are easily confused by the city having the same name as one of its constituent towns. Stoke is one of six towns that make up Stoke-on-Trent, along with Burslem, Fenton, Hanley, Longton and Tunstall. Mr Wolfe believes a change of name could help to attract investment to the city, as well as giving local people a stronger sense of identity. Speaking to BBC Radio Stoke, Mr Wolfe said the confusion over the name is bad for the city. "The business community tells me we've lived very unsatisfactorily with it - people of Stoke understand the problem. "Living with it every day, living with lost lorry drivers driving round the city, probably makes people understand what I'm on about," he said. It is now very rare for English towns and cities to have their names changed. Past alterations have usually amounted to little more than the tacking on of an extra word, such as when Bognor became Bognor Regis in honour of King George V.
Such changes are also rare outside of the UK, although there are many instances of cities having their original names restored, including Calcutta reverting to Kolkata and Leningrad to St Petersburg.